The first Campionette, the student newsletter, was published 100 years ago, on November 11, 1917. The first Editor of the Campionette was Tom O'Connor, class of 1920. The last official issue was the one announcing the closing of the school in May 1975. Over the years various classes have published special editions for their class reunions, of which some have been pretty extravagant. The Campion Forever Newsletter was first published by Aaron Huguenard, class of 1947 in 2000 as a means for alumni and faculty to keep in touch and share in life experiences. We've been trying to get memoirs from retired and not-so-retired Campion Jebbies for our newsletter for quite some time. We don't care if the memoirs are about when they went to Campion, taught at Campion, or just what they've done since leaving Campion. We just want to hear something from our mentors in the first person; perhaps words of wisdom learned while IHS; typically we only get 3rd person post mortem. Not to lay all the blame on the Jebbies... why can't we get memoirs from more alumni. Where are all those other authors and editors of the old 'ette. While it has been a task getting people to submit articles, there are a few dedicated alumni and Jebbies who do regularly provide ideas for articles. This is a good thing, else I would have to conjure the 'Ghost of Joe Campion' for ideas more than I care to. This issue is released on Christmas and again on New Years with additional items. Jesus doesn't care if we say "Merry Christmas" ?? no man comes to my Father but by me alone." God Jul - Merry Christmas! My father was a man who taught by example. If I had been a better student and a better son I'd have learned a lot more from him than I did. Nevertheless, one of the most enlightening lessons I actually did manage to learn from him was in regard to the virtue of forgiveness. His first child and my older sister was born with a growth defect. Despite our parents and doctors efforts, Beth never reached a height of more than 4 feet & 10 inches...in short, a tall dwarf, so to speak. She endured a great deal of mockery while growing up and never had a boyfriend. My father was her best friend. He adored her and was the primary pillar of strength throughout her life. Being raised in the Catholic Church during the 1950s; it wasn't all that unusual for parents of five children to hope that one of them would become either a priest or a nun. They gave up on me at a very early stage. Beth, however, took the bait...she developed a genuine vocation and entered The Order of the Sacred Heart at the age of twenty-three. I visited her at a novitiate in Boston on returning from Europe. It was the happiest I'd ever seen her. We sat around the kitchen table with her friends talking and laughing. Sadly, that was the last time we ever talked or laughed together. While bumming around Los Angeles looking for a job in May 1975, I received a call from a friend of my father's. My sister had been in an accident and I was instructed to return home immediately. Upon entering the hospital room, I saw Beth comatose in bed; head wrapped in bandages and hooked up to half a dozen IVs. My father stood motionless in front of a picture window overlooking the street. It was a beautiful spring afternoon. When I walked over to my father I heard him mumbling to himself. He pointed to the street below and said, "I can't believe what I'm seeing." "I can't believe all those people and all those cars and buses are still moving." In essence, his world had come to a screeching, heartbreaking stop. In addition to my mother, Beth was the love of his life and, suddenly, she was gone. Four years later, my father would be gone, as well. He never fully recovered. Still, he stayed true to his noble character. "I'm sure you are truly sorry for what happened. It was an accident but, one you will have to live with for the rest of your life...as will I. Please don't let this sink you into a deep sense of remorse and depression. You have your whole life in front of you...make the most of it. For whatever it may be worth, I forgive you. Now, I beg you, please forgive yourself. Pray for God's help." Imagine forgiving the person who killed your child! And yet, knowing my father, I know he meant it. So, a lesson learned. My sister was twenty-five when she died. On the day before Thanksgiving of that year, the boy went down to the basement and hung himself. He had just turned eighteen. A tragedy compounded by tragedy. I only remember my father laughing once after Beth died. We were on our way back to his company following a business lunch about a year later. For some reason, a radio station was playing some Richard Pryor routines. My father began laughing so much he nearly had to pull off to the side of the road. I will be forever grateful to Richard Pryor for that. [EDIT:] Don's dad, Donald Senior, was a graduate of CJHS class of 1941. This is my annual Christmas letter. It is to give you some information on how I am doing. For an 87 year old I am getting along quite well. Over a year ago my right foot had to be amputated due to an infection and poor circulation. I'm able to put on and take off my prosthesis which weighs flve pounds. I walk in the building and go outside in nice weather. I have some lung and heart problems. Basically I am very fortunate to be alive and to be useful in small tasks. I am able to attend Mass daily and pray for all the benefactors, friends, and relatives of the fifty retired Jesuits living here. On January 8th, the Jesuits will be moving into a new building. Thanksgiving is almost here. 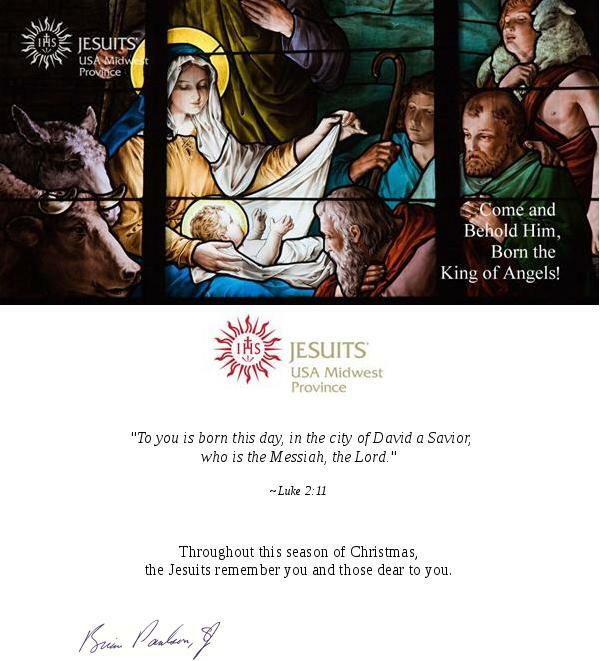 I am thankful for the sixty-four years that I have been a Jesuit. AIso thankful for loving parents, and a wonderful sister and brother. I miss my parents, brother and sister. Some of you I have not seen for several years. But rest assured I have not forgotten you in my prayers and Masses. You are special to me and true friends and treasures. So at Thanksgiving and Christmas I will offer special prayers for you and your loved ones. It's too far down there, man. No way can I jump. I have to be crazy coming this close to the edge. I had myself all built up and I was prepared to jump. But no way, man. I can't jump now. I can't get my nerve back! I am gonna back out. I'm chicken. It's not going to make things any better for anyone if I jump so I have a good enough reason not to jump. The insaneness to jump has been building up in me for months; even years. But now that I have the opportunity to do it; it's another story! Oh no, they are coming up behind me. I can't stand their belly achin' at me. I'll have to jump. I have to jump. Here goes! Oh, it's so far down there. I've been falling forever. I leaped off the ledge hours ago. The surface below is waving all over the place. I just know it's gonna hurt. I am going to land on my face or back or belly or legs. In any case I know it's gonna hurt. I've heard people say that you don't feel a thing. It doesn't make any difference what they say; I'm the one who is going to hit the surface coming towards me. Oh far out! That didn't hurt a bit! The water is a little chilly, but I didn't feel a thing. I just kind of swooshed through the water. Everybody was right; diving is fun and thrilling. I'm going back up and jump again. Some of my greatest memories of Campion, and there are numerous, were the times when we as mere students could and/or would find surreptitious ways to challenge the Jesuit control of our class, a class whom we considered far more enlightened than those that matriculated before us. Clearly we were delusional but that is, and must be, the context of this story. It was the senior year of the Class of 1972. Those of us who were a part of that experience, particularly those of us who were born in January of 1954, remember it well because the state of Wisconsin, in its infinite wisdom, and I mean that with every fibre of my being, decided to change the drinking age from 21 to 18!! This change was not to take effect until sometime in March, 1972, probably around St. Patrick's Day (timing is everything!!). Now for most of the senior class, this change meant nothing as they were mere youths that could not take advantage of this legislative largesse. But for Bill Bergstrom and me, it was an opportunity to create yet one more indelible memory of our time as Campion compadres. Now, I concede that my entire recollection of the events of the evening in question may be somewhat hazy after 45 years of recall, but I feel certain that it is pretty accurate as it was one of the most memorable nights of my life. Bill Bergstrom and I were in his room in Xavier Hall listening to music with Mike Corr and Peter Allgera. In between our discussions of Kant and Camus (yes I'm kidding), a discussion of the new drinking age law was broached. Bergy and I just happened to note that we were both now of legal drinking age in the state of Wisconsin. I just happened to mention that it might be a boon to the local Prairie du Chien economy if Bergy and I were to sneak off campus and visit one of the local watering holes to, you know, spread around the wealth of two students who couldn't rub two pennies together. SO! the four members of this group pooled our funds so that Bergy and I could have a couple of adult beverages in downtown Prairie. After all of the high finance calculations, Bergy and I were off and running. Of course, this was now after midnight because that was the beginning of the legal 18 drinking age. The important thing to remember about all of this is that the Dean of Students at Campion at that time, Fred Gates, was very aware of the change in the drinking age law and was on the prowl for any miscreants trying to take advantage of the new law. Bergy and I were undeterred!! So, off we snuck into the night. We knew that Fred Gates was on the prowl so we kept close to trees and bushes where we could find cover when we saw Fred's car. Bergy and I were the epitome of stealth. Diving into bushes when we saw Fred's car until finally, YES!! we were in downtown Prairie (did any of my classmates ever think you would hear those words). Now we need to decide where we can get a drink. Right in front of us is the Prairie bar with the horse over the front entrance (I apologize that I don't remember the name since I know it has been there forever) I think it was just called The Saloon but I don't remember. Anyway, Bergy and I walk in like we own the place and we are the youngest people in there by about 40 years. As soon as we walk in, every old codger in the place, all of whom are wearing cowboy hats by the way (in Prairie du Chien...REALLY!!) and they stop drinking, sit up straight and look at Bergy and me like we are aliens from another planet. We walk in and I sit down next to the biggest "cowboy" with the biggest gut and the newest cowboy hat and say "Howdy"! He was not impressed. Again, Bergy and I were undeterred. Bergy ordered a draft and I order a vodka tonic. The bartender was an older woman and when she took our order the diplomat in the new cowboy hat next to me said "You're not really gonna serve these shitheads are you??" The bartender checked our IDs (very carefully) and replied "Yeah, I am...their legal". To this day, I'm not sure, but I'm pretty sure that I saw a glimpse of a smile on that bartender's face at just that moment. It was almost like she had been in our position before and admired the fact that we actually had the balls to come into that bar after midnight and do what we did. Little did she know that we were just too stupid to know better and just wanted to take our next step from being the Campion boy to becoming the Campion man. So, after two or three drinks, Bergy and I actually won over some of the old codgers at the bar. The cowboy next to me actually bought me a drink and the entire bar got a kick out of our story about sneaking off campus. A couple of them actually offered to drive us back to campus to avoid Fred Gates but Bergy and I knew it was a challenge we had to face. We looked out in front of the bar and saw Fred's car driving back and forth. The patrons at the bar were now our lookouts and let us know when he was far enough away to make our escape. We wished everyone well and headed out. About half way back to campus we thought we were home free when we saw headlight flashes. We dove into the bushes and watched Fred's car slowly glide by. Bergy and I extricated ourselves from the bushes and made our way back to Xavier Hall without further incident. In my mind's eye, and forever, I will always believe that Bergy and I got away with this Sojourn off campus. But, knowing Fred Gates, he very well may have had the last laugh...and God bless him for it!!! Prior to the age of majority (adulthood), and thus the drinking age, being lowered to 18, Wisconsin was an "18 bar" state. Meaning 18 to 20 year olds could drink only beer at specified bars only. Interestingly, when the age limit was later increased to 19 in 1984 and then to 21 in 1986, the "18 bar" concept was deprecated. On '21' of March in 1972, coinciding with the State Law changes, the Dean of Students, Fred Gates, published the schools policy and warning of ramifications about coming of legal age. Fred Gates was Dean of Students from 1970-1973. Fred passed on the Feast of St. Campion, 1 December 2017. [EDIT:] Apologies for the liberal slant, but still funny. One of the continuing mysteries about the closing of Campion High School, caused at least in part by financial problems and an enrollment that had decreased to 290 students in the school's final year, was how another religious group could buy the real estate and operate a school in the same place for another 14 years. Presumably the fixed expenses of utilities and food costs were about the same, or perhaps even larger. What follows here is a closer examination of MLPS, based on information available to the public in their catalog for the 1991-1992 school year. This article will not concentrate on the re-purposing and renaming of buildings, or the relocation of campus artifacts. We know that Lucey Hall became a girls dorm, and that Marquette and Xavier Halls remained as boys dorms, and that Marquette Hall wasn't needed for student occupancy after the early 1980s. Lawler Hall, the former administration and Jesuit residence building was adapted to become a classroom building, with every three bedrooms turned into one larger classroom. Campion Hall was vacated and eventually torn down. 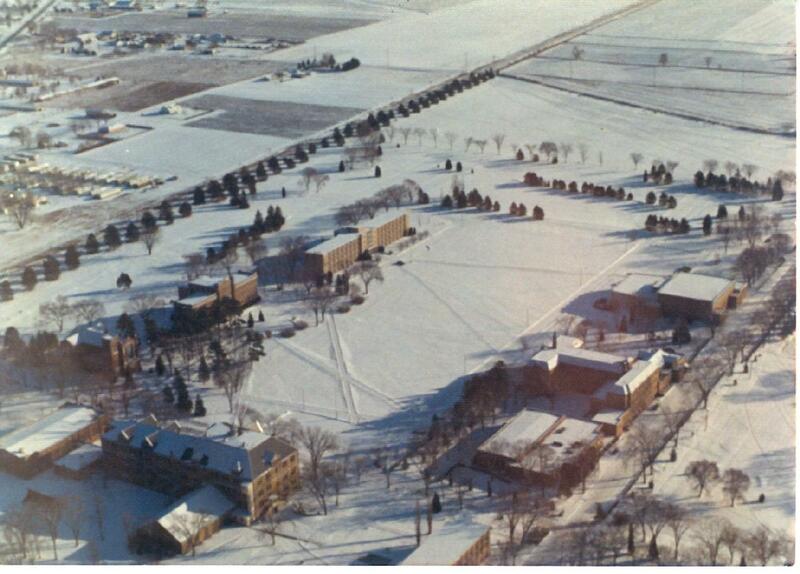 When Martin Luther Preparatory School began operations on the Prairie du Chien campus in 1979 they had 362 students. Enrollment in the 1990-1991 school year was listed as 199: 62 in 9th grade, 39 in 10th grade, 51 in 11th grade, and 47 in 12th grade. 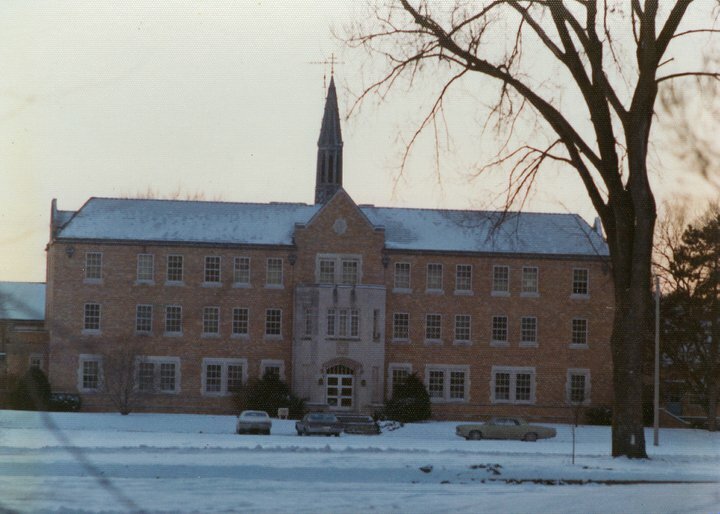 In 1995, the school was merged with Northwestern Preparatory School in Watertown, Wisconsin and the Prairie du Chien campus was sold to the State of Wisconsin for use as a prison. MLPS lists $6,749.00 as the total yearly cost of tuition plus room and board. Based on the above stated enrollment figures, this would mean that the school could count on $1,341,051 in tuition plus room and board income. Because of the school's role in the educational system of the Wisconsin Evangelical Lutheran Synod, the Synod itself pays for about 49% of the cost. Thus, each student's family must pay $1,670.00 tuition plus $1.770.00 room and board. There are two important notes about tuition: When a family sends two or more children to the school, the younger ones have a $250.00 discount on the tuition amount. Also, those students who enroll, but are not in confessional fellowship with WELS and who are not preparing for church work in the synod, are charged double for tuition, that is, $3,440.00, plus the usual $1,770.00 room and board charges. In addition, there are general fees of $128.00 and special fees, of which the most significant is $150.00 for piano or organ lessons and rental. In general, there would be about $350,000.00 allocated to room and board expenses, and about a million dollars toward the total school program, especially including teacher and administrative salaries, instructional expenses, and general administrative and maintenance expenses. Fortunately, about $650,000.00 of this would come from the Synod. They make it clear that the school does not discriminate on the basis of race, color, or national/ethnic origin. At the same time, it is clear that they have an institutional focus on the needs of the Wisconsin Evangelical Lutheran Synod (WELS), and non-members of the Synod are charged a higher tuition. It is understandable that the Synod would not subsidize the tuition of non-members. **Teachers' course students may take Spanish instead of German in 11th and 12th grade..
***Teachers' course students may take General Science instead of Latin I.
Latin II, III, and IV are electives for Teachers' course students who took Latin I.
Sixteen credits are required for graduation, including 4 in English, 2 in Social Studies, 2 in Science, 2 in Math and 2 in German or Spanish. (These are the 5 day/week courses, 45 minute class periods). In addition, there is a program of intramural and interscholastic athletics. As a general rule, there were no pure electives. There are some courses that were required for some students, but were electives for others. They consider Latin mandatory for Pastors' course students, and elective for those who plan to become teachers in the WELS school system. Students in the Pastorsâ€™ course could elect to take General Science in addition to Latin, if they could fit it into their schedules. So the question is, how did they get all this done, get all these classes taught, on such a limited budget? The way to answer this is to look at the number of instructional positions: Seven administrators (all of whom have teaching duties), seven teachers on the faculty, plus two instructors and five tutors: I believe those identified as teachers have permanent appointments to the faculty, while instructors and tutors are temporary employees. Perhaps this is something like the difference between priests and scholastics on the Campion faculty. Additionally there are 3 Piano tutors, part time. Coaching duties are added to positions number 4, 6, 11, and 12. Additionally there was one man assigned full time to recruiting, a business manager, a school nurse, a housemother for the girls' dorm, a food service manager, and a secretary who worked for the President and the faculty. Military Science classes were two periods per week. Additionally, all students had 2 hours/week of Military Drill and mandatory participation in Intramural leagues, in lieu of Physical Education classes. (except those on Interscholastic sports teams). Campion did not have Biology, at least not as of the early 1960s. Campion did not have computer literacy, but that could be explained by the growth in the use of computers in the 1970s and 1980s. Campion did not have German as a language option. Campion had virtually no music in its curriculum, except for optional participation in Band and Choir/Glee Club. I would not advocate that Campion should have as many music requirements as MLPS had, but I have known high school graduates who took a music course in high school and benefited from it in later life. Campion did have Greek, taught to those in the classical honors course (3A and 4A) section. Campion did have more students taking advanced levels of math, which represents a difference in educational philosophy in the different types of schools. MLPS was designed to nurture vocations to the Lutheran ministry, and to educate those who would want to teach in the Lutheran school system. This is not unlike the schools operated by Fr. McMahon's order, which I referred to in my "Big Change" article in the October 2016 issue of Campion Forever. On the other hand, Campion's purpose was to be a complete College Preparatory school. The Jesuits were pleased when their graduates would choose to join the Jesuit order, but that was not, per se, the institutional purpose of the school. Consequently, it was important for Campion to offer a full four-year program in Math, though some students were able to take social studies courses in junior and senior year instead of Math. In the world of education today, there is a greater emphasis placed on Science, Technology, Engineering and Math. As for this continuing mystery of Campion's financial difficulties, compared with the operations of MLPS, the answer seems clear, once you look at the fall 1974 red book directory and see how many administrators, faculty members and other staff were employed by Campion High School in its final year. We do remember that, when Fr. Kalb became President, he continued to teach Advanced Algebra. But we never saw other administrators teaching. True, Campion had a larger enrollment than MLPS, but it seemed that in its later years, it was losing money fast. Information about the curriculum at Campion in the later years shows that there were elective courses, electives can add substantially to instructional costs. One must recognize that the faculty and staff at MLPS were devoted, hard-working people and their dedication included doing something more than full time work. I once taught in a Catholic school in Chicago, since closed, that had its Disciplinary Dean assigned to teach Social Studies. This meant that, if some issue came up during the school day, a teacher might not be able to talk to the Dean. Not an ideal situation, especially not for a school in Chicago. But it is clear that the students at MLPS were a very different kind from those in Chicago. When students behave well, a system like they had at MLPS can work out well, and costs can be reduced. Bad behavior by students adds to the cost of running a school. A lot of the success of a school comes down to attitude, that is, attitude of the faculty and administration toward the students, their parents and others who support the school, and the attitude of the students toward the school. I was looking for a statement that would clarify this situation at MLPS, and found a 2015 statement about its successor school, Luther Preparatory School, that fits. If you are a member of WELS, you own Luther Preparatory School, along with our other three preparatory schools. . . .Approximately 35% of Luther Prep's financial support comes directly from WELS Congregation Mission Offerings. As for student attitudes, that same document says, a few paragraphs down, LPS is a normal high school in that it provides a college prep curriculum for all students and it offers a full array of cocurricular activities-sports. music, drama, forensics, and various clubs. Yet it differs. Some differences are small. Ninety percent of LPS students live in one of the three dormitories. Some students will say "It's like having a sleepover with your friends every night." For the past 150 years the students on this high school campus enjoyed two hours of study hall, Sunday through Thursday nights. They eat three meals a day with their friends in the cafeteria... Other differences are monumental. Every teacher and dorm staff supervisor has graduated from Martin Luther College or Wisconsin Lutheran Seminary. Every class is taught in light of God's Word. Now this description seems so ideal that one wonders if it could actually be true. I am certain that the Lutherans don't have everything exactly right. But they had a lot of things right. Some of this is related to the school's focus on preparing students for Lutheran ministry, or for careers as teachers in Lutheran schools. They were not intending to prepare students for all kinds of academic adventures in highly-rated colleges and universities. As Campion was in the process of closing, there was the lament that the school seemed to lack this kind of focus. There were questions about student behavior at Campion in the later years, while the MLPS catalog indicated some strict rules and standards which guided the focus of students and faculty. So yes, there were a lot of differences, even between schools that called themselves college preparatory. This helps answer the original question above. The other obvious question is why did MLPS fail to draw the enrollment it needed to stay open. There is still a substantial enrollment at the merged school in Watertown, Wisconsin. But the total enrollment of Lutherans who want to go into the ministry, and who want to teach in Lutheran schools clearly decreased. Among all the changes in society in the 1980s and 1990s, there may be fewer members in their various congregations. It is a question for the Lutherans to figure out. Once more you've done a great job! I really enjoyed reading this issue of "Campion Forever". My days there (where the Mississippi and Wisconsin roll their tides in one), some 6-7 decades ago, were some of the happiest of my life. I remember them still in great detail. And you help me. Thanks much. Alumni who have passed in 2017, 2016, 2015, 2014, 2013, 2012. Fred Gates 2017-12-01, 1970-1973 Dean of Students.